Brett Lodge was born in Australia and educated at the Royal Military College, Duntroon, the University of New South Wales and the University of London. 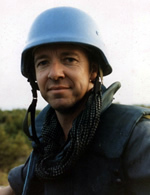 A former soldier, journalist, academic and documentary producer, Brett has also worked for the United Nations in the Middle East, South-East Asia, Africa and the former Yugoslavia. His UN posts have ranged from murder inquiries to responsibility for reporting to the Secretary-General on political, humanitarian and security matters. In Cambodia in 1992 he investigated human rights abuses, dealing frequently with the Khmer Rouge who threatened him with death because of his work. The next year found him in Bosnia during some of the most intense fighting of the war. He experienced Sarajevo at its worst and was part of a UN force taken hostage in Mostar. He has travelled widely throughout the Middle East and was stationed in the region during both Gulf Wars and both Palestinian intifadas, when he worked in the West Bank and Gaza dealing with Israeli and Palestinian security forces. He has a PhD in politics and history and has published two biographies of controversial Australian soldiers: the first of Lieutenant-General Gordon Bennett, at one point the youngest general in the British Empire armies, who won the DSO and was Mentioned in Dispatches eight times during the First World War, but who fell from grace following controversy over the 1941 Allied surrender at Singapore. The second is a biography of Lieutenant-General Sir John Lavarack who was sacked as Chief of the General Staff in 1939 but went on to be the first Allied commander to defeat an attack by Rommel at Tobruk in April 1941 and who wrested Syria and Lebanon from the Vichy French. Brett Lodge is currently a senior official with an anti-terrorist organisation in the Middle East. I was extremely lucky to meet Andrew through a friend who happened to be one of his authors, the late Tom Pocock - a wise, humorous and intelligent man who certainly knew an excellent agent and a good bloke when he saw one. I am very grateful to him indeed.